White Cloud Charter, LLC has been providing luxury private air travel since 1995, and in 2007 was acquired by Conair Corporation. We operate under a secure financial umbrella, assuring our clients travel with the utmost safety, security and VIP service. The aircraft are conveniently based in White Plains, New York, at the Westchester County Airport. At White Cloud Charter, the essential elements of private luxury travel come together to please the most discerning business or leisure traveler. 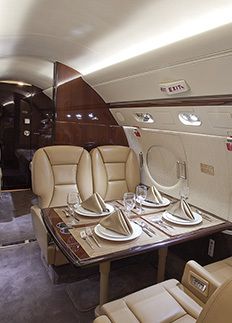 Aboard every flight you will be treated to attentive, first-class service within a state-of-the-art Gulfstream aircraft, and all the comforts an exacting traveler expects. We offer you your very own executive travel concierge, who handles every last detail including ground transportation, in-flight catering and any special requests or requirements you have. With White Cloud Charter getting there is effortless. Join us and experience the highest standard of luxury in private jet charter.